This article is about the year 1938. Year 1938 (MCMXXXVIII) was a common year starting on Saturday (link will display the full calendar) of the Gregorian calendar. 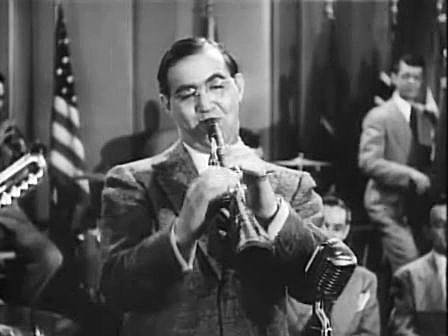 January 16: Benny Goodman in NYC. The new Constitution of Estonia enters into force, ending the Era of Silence and the authoritarian regime. Sir Alexander Cadogan succeeds Sir Robert Vansittart as permanent under-secretary at the British Foreign Office; Vansittart is "kicked upstairs" by being given the new and unimportant office of Chief Diplomatic Advisor to the Government. The Merrie Melodies cartoon short Daffy Duck and Egghead is released, being the first cartoon to give Daffy Duck his current name, as well as his second appearance. January 3 – The March of Dimes is established by Franklin Delano Roosevelt. January 12 – The German War Minister Field Marshal Werner von Blomberg marries Eva Gruhn in Berlin; Hermann Göring is best man at the wedding. January 16 – Two landmark live recordings are produced this day: the very first of Mahler's Ninth by the Vienna Philharmonic under Bruno Walter in the face of dire circumstance; and Benny Goodman and his orchestra become the first jazz musicians to headline a concert at Carnegie Hall in New York City. January 20 – King Farouk of Egypt marries Queen Farida Zulficar in Cairo. January 25 – A brilliant aurora borealis described variously as "a curtain of fire" and a "huge blood-red beam of light" startles people across Europe and is visible as far south as Gibraltar. Adolf Hitler abolishes the War Ministry and creates the Oberkommando der Wehrmacht (High Command of the Armed Forces), giving him direct control of the German military. In addition, Hitler sacks political and military leaders considered unsympathetic to his philosophy or policies. General Werner von Fritsch is forced to resign as Commander of Chief of the German Army following accusations of homosexuality, and replaced by General Walther von Brauchitsch. Foreign Minister Baron Konstantin von Neurath is sacked and replaced by Joachim von Ribbentrop. Walt Disney's Snow White and the Seven Dwarfs, the first cel-animated feature in motion picture history, is released in the United States. February 20 – Sir Anthony Eden resigns as British Foreign Secretary following major disagreements with Prime Minister Neville Chamberlain over the best policy to follow in regards to Italy, and is succeeded by Lord Halifax. March – Italian mathematician Ettore Majorana disappears. The Santa Ana River in California spills over its banks during a rainy winter, killing 58 people in Orange County and causing trouble as far inland as Palm Springs. Sir Nevile Henderson, British Ambassador to Germany, presents a proposal to Hitler for an international consortium to rule much of Africa (in which Germany would be assigned a leading role) in exchange for a German promise never to resort to war to change her frontiers; Hitler rejects the British offer. March 14 – French Premier Léon Blum reassures the Czechoslovak government that France will honor its treaty obligations to aid Czechoslovakia in event of German invasion. March 15 – Soviet Union announces officially that Nikholai Bukharin has been executed. In a result that astonished even Hitler, the Austrian electorate in a national referendum approved Anschluss by an overwhelming 99.73%. April 16 – London and Rome sign an agreement that sees Britain recognise Italian control of Ethiopia in return for an Italian pledge to withdraw all its troops from Spain at the conclusion of the civil war there. April 18 – First appearance of Superman. The date Action Comics #1 was published (June Cover) according to court documents released during the legal battle over the rights to Superman. DC Comics recognizes May 3, 1938 as the publishing date. April 24 – Konstantin Päts becomes president of Estonia. April 28 – The towns of Dana, Enfield, Greenwich, and Prescott in Massachusetts are disincorporated to make way for the Quabbin Reservoir. The Vatican recognizes Franco's government in Spain. May 9 – Kaarel Eenpalu becomes prime minister of Estonia. May 12 – U.S. Secretary of State Cordell Hull rejects Russia's offer of a joint defence pact to counter rise of Nazi Germany. May 17 – Information Please debuts on NBC Radio. May 21 – Matsuo Toi kills 30 people in a village in Okayama, Japan, in the Tsuyama massacre, the world's worst spree killing by an individual until 1982. May 23 – Temporarily frustrated by the Czechoslovak mobilization and international diplomatic unity in the face of German demands over the Sudetenland, Hitler orders the Foreign Office to assure the Czechoslovaks that he has no demands on their territory. The world at large mistakenly believes the crisis is averted. Spanish Civil War: Alicante, Spain is bombed, resulting in 313 deaths. The Soviet ambassador to the United States A.A. Troyanovsky declared that Moscow was ready to defend Czechoslovakia. This offer was ignored by Britain and the U.S.A.
May 28 – In a conference at the Reichs Chancellery, Hitler declares his decision to destroy Czechoslovakia by military force, and orders the immediate mobilization of 96 Wehrmacht divisions. May 30 – Poland who had its eyes on the Teschen region of Czechoslovakia was reassured by Rumania that it would block any attempt by the Soviet Union to come to the aid of the Czechs in the event of a Polish invasion. June 11 – Fire destroys 212 buildings in Ludza, Latvia. June 12–June 18 – The Roma and Sinti peoples in Germany and Austria are rounded up, beaten up and jailed. June 19 – Italy beats Hungary 4–2 to win the 1938 World Cup. June 22 – Heavyweight boxing champion Joe Louis knocks out Max Schmeling in the first round of their rematch at Yankee Stadium in New York City. June 24 – A 450-metric-ton (Template:Convert/LonAonSonNa) meteorite explodes about 12 miles (19 km) above the earth near Chicora, Pennsylvania. June 30 – Action Comics #1 is published, which is the first publication featuring the comic book character Superman. The steam locomotive Mallard sets the world speed record for steam by reaching 126 mph. The last reunion of the Blue and Gray commemorates the 75th anniversary of the Battle of Gettysburg in Gettysburg, Pennsylvania. July 5 – The Non-Intervention Committee reaches an agreement to withdraw all foreign volunteers from the Spanish Civil War. The agreement is respected by most Republican foreign volunteers, notably by those from England and the United States, but is ignored by the governments of Germany and Italy. July 6 – The Evian Conference on Refugees is convened in France. No country in Europe is prepared to accept Jews fleeing persecution and the United States will only take 27,370. The prospect for European Jewry looks bleak. July 14 – Howard Hughes sets a new record by completing a 91 hour airplane flight around the world. July 22 – Britain rejected a proposal from its ambassador in Berlin, Nevile Henderson, for a four power summit on Czechoslovakia consisting of Britain, France, Germany and the U.S.S.R. London would under no circumstances accept the U.S.S.R. as a diplomatic partner. July 24 – First ascent of the Eiger north face. July 28 – A revolt against the Ioannis Metaxas dictatorship is put down in Chania, Greece. July 30 – The first ever issue of The Beano is published. August 4 – Lord Runciman arrives in Prague to act as Neville Chamberlain's special envoy in the continuing Sudetenland disturbances. August 6 – The Looney Tunes animated short Porky & Daffy is released. Ewald von Kleist-Schmenzin arrives in London looking for British support for an anti-Nazi putsch, using the looming crisis over the Sudetenland as a pretext. His private mission is dismissed by Neville Chamberlain as unimportant (Chamberlain refers to von Kleist as a "Jacobite"), but he finds a sympathetic if powerless audience in Winston Churchill. August 22 – Civil Aeronautics Authority (independent agency). August 27 General Beck leaves office as Chief of the General Staff; he is replaced by General Franz Halder. August 28 – Lord Runciman's mission to mitigate the Sudetenland crisis begins to break down. British Prime Minister Neville Chamberlain recalls the British Ambassador Nevile Henderson from Berlin, to instruct Henderson to set up a personal meeting between Chamberlain and Hitler. August 31 – Winston Churchill, still believing France and Britain mean to honor their promises to defend Czechoslovakia against Nazi aggression, suggests in a personal note to Neville Chamberlain that His Majesty's Government may want to set up a broad international alliance including the United States (specifically mentioning U.S. President Franklin Delano Roosevelt as possibly receptive to the idea) and the Soviet Union. September – The European crisis over German demands for annexation of the Sudeten borderland of Czechoslovakia heats up. September 2 – Soviet Ambassador to Britain Ivan Maisky calls on Winston Churchill, to tell him that Soviet Foreign Commissar Maxim Litvinov has expressed to the French chargé d'affaires in Moscow that the Soviet Union is willing to fight over the territorial integrity of Czechoslovakia. September 4 – During the ceremony marking the unveiling of a plaque at Pointe de Grave, France celebrating Franco-American friendship, American Ambassador William Bullitt in a speech states, "France and the United States were united in war and peace", leading to much speculation in the press that if war did break out over Czechoslovakia, then the United States would join the war on the Allied side. September 5 – Czechoslovakian President Edvard Beneš invites mid-level representatives of the Sudeten Germans to the Hradcany palace, to tell them he will accept whatever demands they care to make, provided the Sudetenland remains part of the Republic of Czechoslovakia. September 6 – What eventually proves to be the last of the "Nuremberg Rallies" begins. It draws worldwide attention because it is widely assumed Hitler, in his closing remarks, will signal whether there will be peace with or war over Czechoslovakia. September 7 – The Times publishes a lead article which calls on Czechoslovakia to cede the Sudetenland to Germany. September 9 – U.S. President Franklin D. Roosevelt disallows the popular interpretation of Bullitt's speech at a press conference at the White House. Roosevelt states it is "100% wrong" the U.S. would join a "stop-Hitler bloc" under any circumstances, and makes it quite clear that in the event of German aggression against Czechoslovakia, the U.S. would remain neutral. September 12 – Hitler makes his much-anticipated closing address at Nuremberg, in which he vehemently attacks the Czech people and President Beneš. American news commentator Hans von Kaltenborn begins his famous marathon of broadcast bulletins over the CBS Radio Network with a summation of Hitler's address. September 13 – The followers of Konrad Henlein begin an armed revolt against the Czechoslovak government in Sudetenland. Martial law is declared and after much bloodshed on both sides order is temporarily restored. Neville Chamberlain personally sends a telegram to Hitler urgently requesting that they both meet. September 15 – Neville Chamberlain arrives in Berchtesgaden to begin negotiations with Hitler over the Sudetenland. September 17 – Neville Chamberlain returns temporarily to London to confer with his cabinet. The Russian army masses along the Ukrainian frontier. Rumania agrees to allow Russian soldiers free passage across her territory to defend Czechoslovakia. September 18 – During a meeting between Neville Chamberlain and the recently elected Premier of France, Édouard Daladier, and Daladier's Foreign Minister, Georges Bonnet, it becomes apparent neither the English nor the French governments are prepared to go to war over the Sudetenland. The Soviet Union declares it will come to the defence of Czechoslovakia only if France honours her commitment to defend Czech independence. In the early hours of the day, representatives of the French and British governments call on Czechoslovak President Edvard Beneš to tell him France and Britain will not fight Hitler if he decides to annex the Sudetenland by force. Late in the afternoon the Czechoslovak government capitulates to the French and British demands. Winston Churchill warns of grave consequences to European security if Czechoslovakia is partitioned. The same day, Soviet Foreign Commissar Maxim Litvinov makes a similar statement in the League of Nations. The New England Hurricane of 1938 strikes Long Island and southern New England, killing over 300 along the Rhode Island shoreline and 600 altogether. Following the capitulation of the Czech government to Germany's demands both Poland and Hungary demand slices of Czech territory where their nationals reside. Unable to survive the previous day's capitulation to the demands of the English and French governments, Czechoslovak premier Milan Hodža resigns. General Jan Syrovy takes his place. Neville Chamberlain arrives in the city of Bad Godesberg for another round of talks with Hitler over the Sudetenland crisis. Hitler raises his demands to include occupation of all German Sudeten territories by October 1. That night after a telephone conference, Chamberlain reverses himself and advises the Czechoslovaks to mobilize. Olsen and Johnson's musical comedy revue Hellzapoppin' begins its 3-year run on Broadway. As the Polish army masses along the Czech border the Soviet Union warns Poland if it crosses the Czech frontier Russia will regard the 1932 non-aggression pact between the two countries void. At 1:30 AM, Adolf Hitler and Neville Chamberlain conclude their talks on the Sudetenland. Chamberlain agrees to take Hitler's demands, codified in the Godesberg Memorandum, personally to the Czech Government. The Czech Government rejects the demands, as does Chamberlain's own cabinet. The French Government also initially rejects the terms and orders a partial mobilizaton of the French army. September 28 – As his self-imposed October 1 deadline for occupation of the Sudetenland approaches, Adolf Hitler invites Italian Duce Benito Mussolini, French Premier Edourd Deladier, and British Prime Minister Neville Chamberlain to one last conference in Munich. The Czechs themselves are not invited. Colonel Graham Christie, assistant British military attaché in Berlin, is informed by Carl Friedrich Goerdeler that the mobilization of the Royal Navy has badly damaged the popularity of the Nazi regime, as the German public realizes that Fall Grün is likely to cause a world war. Munich Agreement: German, Italian, British and French leaders agree to German demands regarding annexation of the Sudetenland in Czechoslovakia. The Czechoslovak government is largely excluded from the negotiations and is not a signatory to the agreement. September 30 – Neville Chamberlain returns to Britain from meeting with Adolf Hitler and declares "Peace for our time". October – The Japanese Imperial Army largely overruns Canton. October 1 – German troops march into the Sudetenland. The Polish government gives the Czech government an ultimatum stating that Zaolzie region must be handed over within twenty-four hours. The Czechs have little choice but to comply. Polish forces occupy Zaolzie. Tiberias massacre: Arabs murder 20 Jews. October 4 – The Republican forces in the Spanish Civil War begin withdrawing their foreign volunteers from combat as agreed on July 5. In Nazi Germany Jews’ passports were invalidated, and those who needed a passport for emigration purposes were given one marked with the letter J (Jude – Jew). October 16 – Winston Churchill, in a broadcast address to the United States, condemns the Munich Agreement as a defeat and calls upon America and western Europe to prepare for armed resistance against Hitler. French Foreign Minister Georges Bonnet carries out a major purge of the Qui d'Orsay, sacking or exiling a number of anti-appeasement officials such as Pierre Comert and René Massigli. Du Pont announces a name for its new synthetic yarn: "nylon". November 1 – Horse Racing: Seabiscuit defeats War Admiral by four lengths in their famous match race at Pimlico Race Course in Baltimore, Maryland. November 2 – Arising from The Munich Agreement Hungary is "awarded" the Felvidek region of South Slovakia and Ruthenia. November 4 – At a public meeting in Epping, Winston Churchill narrowly survives an attempt by fellow Conservative and constituent Sir Colin Thornton-Kemsley to remove him from Parliament. November 7 Ernst vom Rath, the Third Secretary at the German Embassy in Paris, is assassinated by Herschel Grynszpan. November 9 – Holocaust – Kristallnacht: In Germany, the "night of broken glass" begins as Nazi activists and sympathizers loot and burn Jewish businesses (the all night affair sees 7,500 Jewish businesses destroyed, 267 synagogues burned, 91 Jews killed, and at least 25,000 Jewish men arrested). The first reported "attack" of The Halifax Slasher mass hysteria incident. Britain formally recognised Italy's control of Ethiopia. In return Mussolini agreed to withdraw 10,000 troops from Spain. November 18 – Trade union members elect John L. Lewis as the first president of the Congress of Industrial Organizations. Benito Mussolini and his Foreign Minister Count Galeazzo Ciano order "spontaneous" demonstrations in the Italian Chamber of Deputies, demanding that France cede Tunisia, Nice, Corsica and French Somaliland to Italy. This begins an acute crisis in Franco-Italian relations that lasts until March 1939. Corneliu Zelea Codreanu, leader of the Romanian fascist Iron Guard, is murdered on the orders of King Carol II. Officially, Codreanu and the 13 other Iron Guard leaders are "shot while trying to escape". A general strike is called in France by the French Communist Party to protest the laws of November 12. December 6 – German Foreign Minister Joachim von Ribbentrop visits Paris, where he is allegedly informed by French Foreign Minister Georges Bonnet that France now recognizes all of Eastern Europe as being in Germany's exclusive sphere of influence. Bonnet's alleged statement (Bonnet always denied making the remark) to Ribbentrop is a major factor in German policy in 1939. Following elections in the Lithuanian city of Memel the Lithuanian Nazi party wins over 90% of the votes. December 16 – MGM releases its successful film version of Charles Dickens's A Christmas Carol. The film is originally intended to star Lionel Barrymore as Ebenezer Scrooge, but Barrymore, ill with arthritis, is replaced by Reginald Owen. December 17 – Otto Hahn discovers the nuclear fission of Uranium, the scientific and tecnological basis of nuclear energy, which marks the beginning of the Atomic age. December 23 – A coelacanth, a fish thought to have been extinct, is caught off the coast of South Africa near Chalumna River. December 30 – The ballet Romeo and Juliet with music by Prokofiev receives its first full performance at the Mahen Theatre in Brno, Czechoslovakia. Establishment of Majlis Khuddam-ul Ahmadiyya by Khalifat-ul Masih II, Mirza Basheer-ud-Din Mahmood Ahmad, the second Caliph of the Ahmadiyya Muslim Community. In West Java, Daeng Soetigna tunes the traditional angklung to play the diatonic scale. The first cartoon to feature a prototypical Bugs Bunny, Porky's Hare Hunt, is released. Herbert E. Ives and G. R. Stilwell execute the Ives-Stilwell experiment, showing that ions radiate at frequencies affected by their motion. Family plots produce 22% of all Soviet agricultural produce on only 4% of all cultivated land. Women are limited by law to a maximum of 10% of the better-paying jobs in industry and government in Italy. March 3 Bruno Bozzetto in Milan, Italy. July 8 – Justin Leiber, American philosopher and science fiction writer. ^ "Daily Pilot - Serving Newport Beach & Costa Mesa, California". Archived from the original on 2009-05-20. http://dailypilot.com/articles/2009/05/17/topstory/dpt-alookback051709.txt. Retrieved 2009-05-18. ^ Ives, Herbert E.; Stilwell, G. R. (1938). "An Experimental Study of the Rate of a Moving Atomic Clock". Journal of the Optical Society of America 28 (7): 215–19. DOI:10.1364/JOSA.28.000215. Retrieved on 2011-09-23. This page uses content from the English language Wikipedia. The original content was at 1938. The list of authors can be seen in the page history. As with this Familypedia wiki, the content of Wikipedia is available under the Creative Commons License. 105 people were married in 1938. There were 0 military battles in 1938.